The research seminar is co-organized by AUA Manoogian Simone Collage of Business and Economics, the AUA Master of Economics Program and the AUA Acopian Center for the Environment. 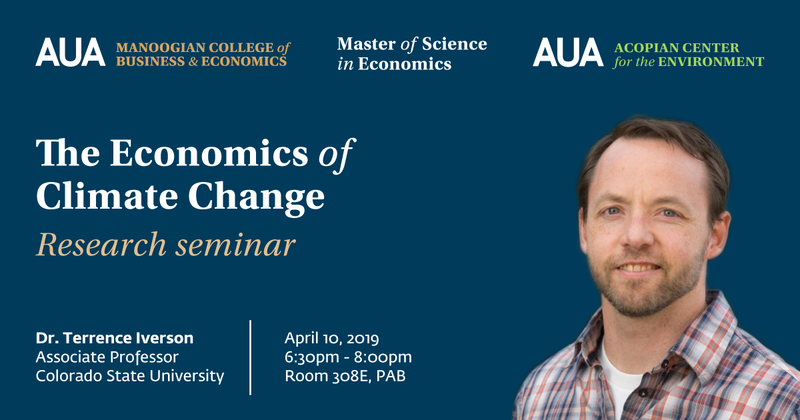 Dr. Iverson is an environmental economist and macroeconomist who uses applied theory, numerical methods, and econometric tools to study issues in the economics of climate change and other environmental policy problems. Examples of his ongoing research include the development of computational methods to incorporate non-constant time preference into general equilibrium climate economy models, the development of an analytically tractable model of urban development with forward-looking investment decisions for a coastal city with rising sea level, the evaluation of carbon capture and storage as a means to avoid supply side leakage in a multi-country climate policy setting with strategic interactions, and an econometric study of the effect of arson on public health in Detroit.